The Louvre may have the Mona Lisa, and the Musée d'Orsay attracts more tour buses, but the Musée National du Moyen Age (a.k.a. the Musée Cluny or the Cluny Museum) is an equally worthwhile destination on the Parisian art-museum scene--at least for visitors with an interest in medieval art, architecture, and culture with a side dish of Roman ruins as a bonus. 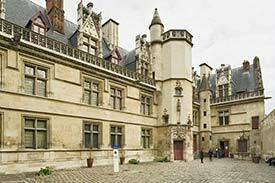 ABOVE: The main courtyard of the Hôtel de Cluny, which houses the Musée National du Moyen Age. The museum entrance is in the corner, just beyond the tower. "The Musée National du Moyen Age was founded in 1843 by the French State, which wanted to combine two exceptional edifices situated in the heart of the Quartier Latin: the Gallo-Roman Baths (1st-3rd c.) and the former residence of the abbots of Cluny (15th c.-) in order to present the works of art assembled by Alexandre Du Sommerard. Enriched over the years by the acquisition of many remarkable masterpieces--tapestries, sculptures, and precious-metal work--the present collection allows the full extent of medieval artistic activity to be discovered and constitutes a valuable testimony to medieval society in Europe." The museum's 23 rooms occupy both the 15th Century Gothic mansion (see large photo above) and the Thermes de Cluny or Gallo-Roman Baths, which are connected to the former abbots' residence. Some exhibits, such as the Lady and the Unicorn tapestries, are world-famous; others are less well-known but fascinating in their own right: for example, some of the Gothic sculptures from Notre Dame, St-Denis, and other Parisian churches were discovered in the basement of a Paris bank in 1977 after having been stolen by vandals during the French Revolution nearly two centuries earlier. In addition to the indoor exhibits, the museum has attractive gardens for adults and children (designed in 2000) that are open to the public without charge. For directions to the museum, opening hours, and a link to the official Musée National du Moyen Age Web site, see this article's visitor information page. Also, we suggest glancing at our captioned Musée de Cluny photos. Top photo copyright © Paris Tourist Office. Photographer: Marc Bertrand.